Definition - What does Bikram Triangle mean? Bikram triangle is a basic yoga posture used in the trademarked style of Bikram yoga. Bikram yoga classes are held in heated rooms and follow a specific series of 26 poses, the ninth of which is triangle. The poses are designed to work all areas of the body in what Bikram yogis believe is the most efficient and effective order. To practice the pose, the legs are spread in a lunge-like position with the arms extended in opposite directions at shoulder height. 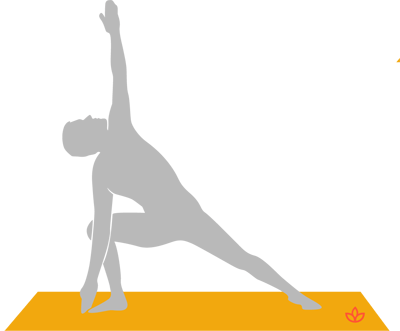 The yogi tilts toward the bent leg with one arm touching the ground near the big toe and the other arm reaching for the sky. Bikram triangle is also known by the Sanskrit name trikonasana, although it may differ from the pose by the same name in other styles of yoga such as Ashtanga. Bikram triangle resembles extended side angle pose with a different positioning of the lower arm, which rests on the knee in the latter posture.